This media console provides you with stylish electronics storage. In the center is one drawer and two open adjustable wood shelves allowing DVD players and cable boxes to be accessed via remote control. Paneled doors sit on either side with two adjustable wood shelves behind each. Fitted with grommets, this media console allows you to control unruly cords and wires and keep electronics safe with the five outlet surge protector and ventilation. 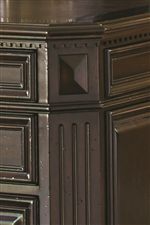 This console sits on traditional bun feet and features beautiful dentil molding along the top for a traditional look. The Prestonwood Ashbourne Media Console with Shelving and Doors by Sligh at AHFA in the area. Product availability may vary. Contact us for the most current availability on this product. Finish & Paint Options Deep russet brown finish. Handles & Hardware Custom hardware in aged brass finish. Case Detail Dentil molding, plinth bases, bun feet and carved stretchers throughout collection. Description: Top Select pieces feature leather tops, tortoise shell finished panels and other decorative accents. Case Construction Crafted from mahogany solids and veneers featuring moderate distressing. The Prestonwood collection is the ideal collection for your home office, study or library update. Choose a double pedestal desk for a large room or use a table desk in a smaller corner. Storage is important in an office setting and with drawers that lock, pencil trays, drop-front drawers for keyboards and more, this collection gives you options for all your storage needs. 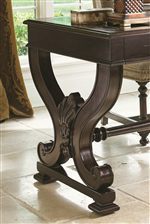 Style features include dentil molding, carved details along legs and stretchers, and a variety of inlaid desk tops giving it a unique look. Classic features and modern technology storage come together to bring you beautiful office pieces for your home. 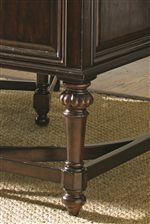 The Prestonwood collection is a great option if you are looking for Traditional furniture in the area. Browse other items in the Prestonwood collection from AHFA in the area.